Let’s be honest: when we think of beautiful, impressive books that will outlast the centuries, we think of tomes: heavy, leather-bound books that look like something Gandalf would peruse. The leather cracked from old age and adorned with gold decorations. Their exterior reflecting the worth of the words and wisdom inside. Now, I’m afraid I can’t bind a book of that size. 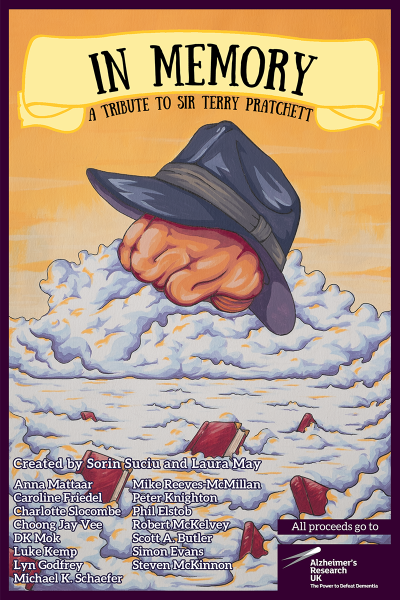 But I can bind In Memory – A Tribute to Sir Terry Pratchett in leather and then decorate it with gold hand tooling. 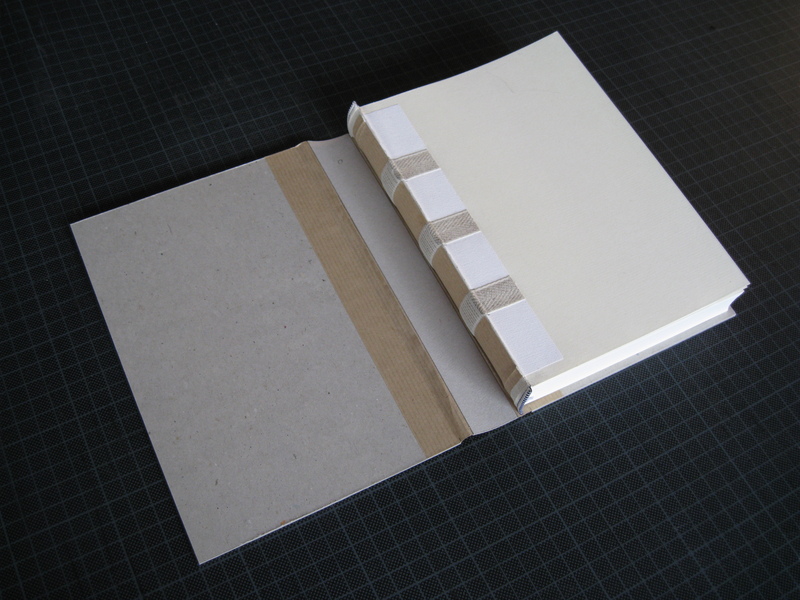 In my last blog post, I’ve shown you how I created the ‘book block’ for this bookbinding project. 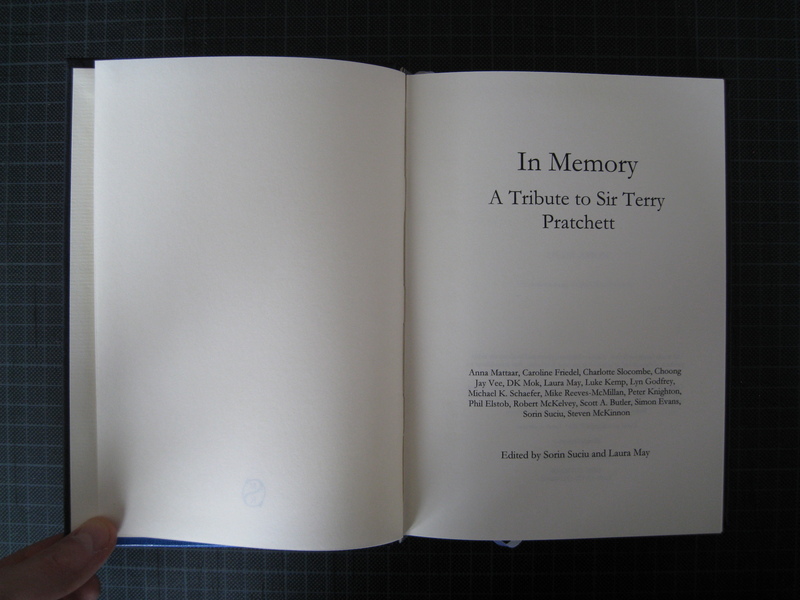 If you have missed it, fear not, you can read it here: Binding ‘In Memory’ — Part 1. This time, I’m showing you how I create a fine leather cover for it. The gold hand tooling will then follow in the next post. The first thing I need to do is to create the ‘case’, i.e. the structure that will be the basis for the cover. 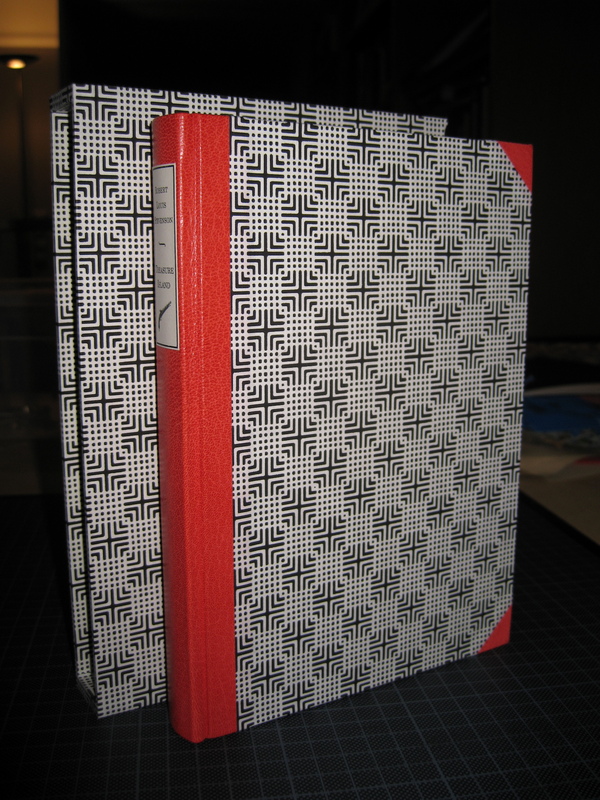 It has to be a little larger than the book block itself so that we get a nice border around the book block. 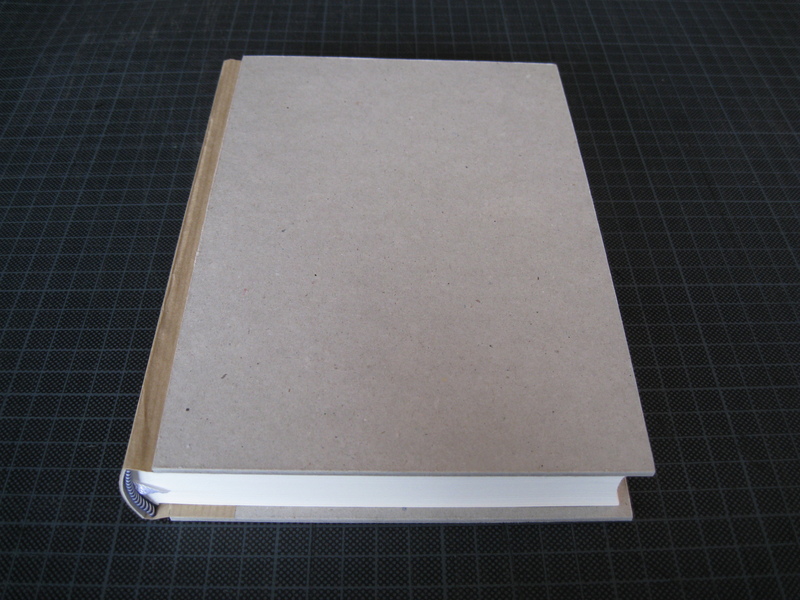 The thickness of the grey board for the front and back cover is 2 mm, while that for the spine is 0.7 mm. The reason for that is that our book block has a rounded spine, and accordingly the board that covers it has to be rounded—and that requires grey board that can actually be bent. 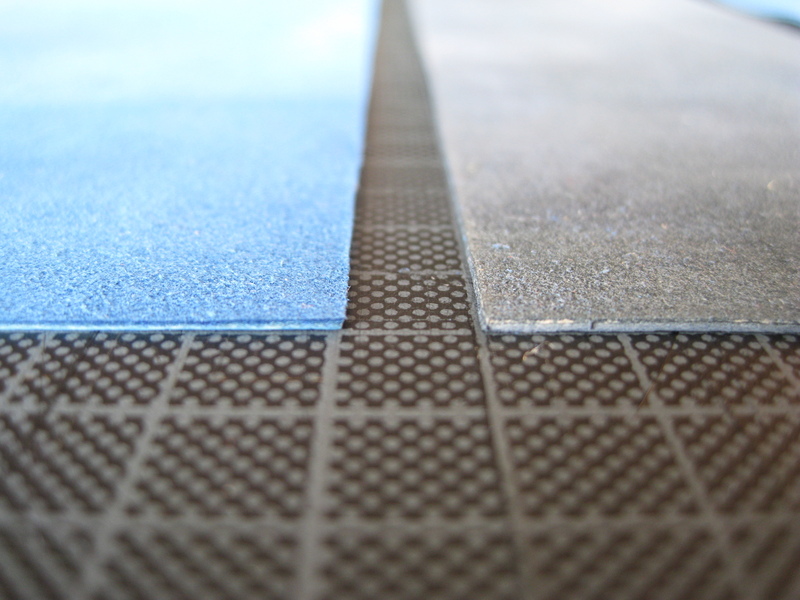 For the front and back, I’m using a special kind of grey board that has a higher rigidity than the normal stuff. It’s sometimes known as ‘binder’s board’. As with paper, grey board has a grain direction, and it’s actually quite easy to check: Take the board in your hands and bend it lightly. Then rotate it 90 degrees and do it again. If the resistance is lower and it’s easier to bend, then you know that the fibres are aligned in this direction. 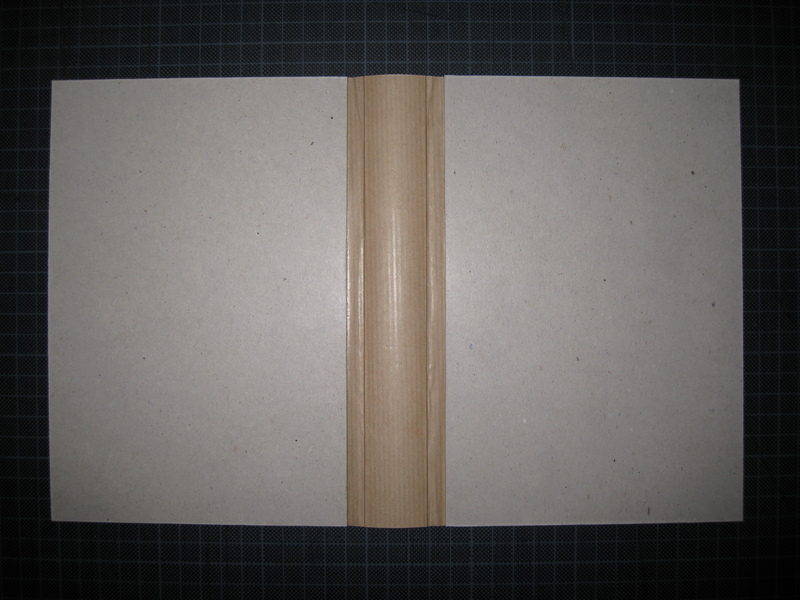 The grey board’s grain direction has to be parallel to the spine, which is also the grain direction of the book block’s paper. 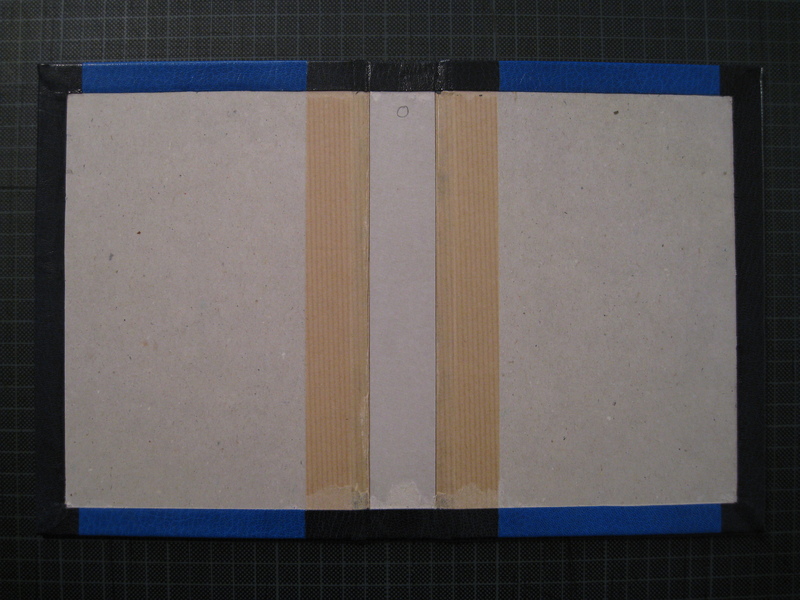 The strong paper serves as the hinges of the case: The thin board for the spine is glued to the paper, which is then glued to the front and back covers. 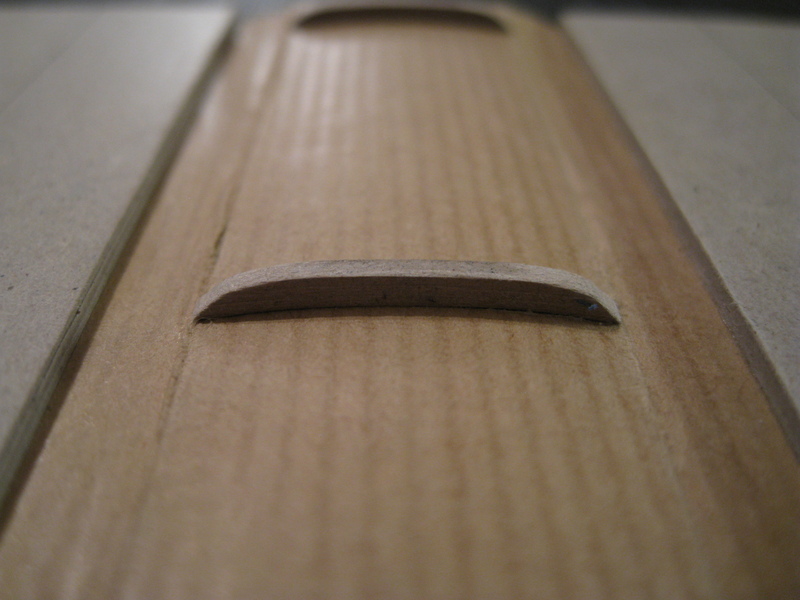 The thin board can then be rounded by ‘pulling’ it over the edge of a table, or by using a round piece of wood onto which the board is pressed to shape it. This case could already be used to create the cover. However, I want this book to have ‘false bands’, and this requires some additional work. What are false bands, I hear you asking? Well, you have probably seen old books in a library somewhere that have a number of bumps across their spines. 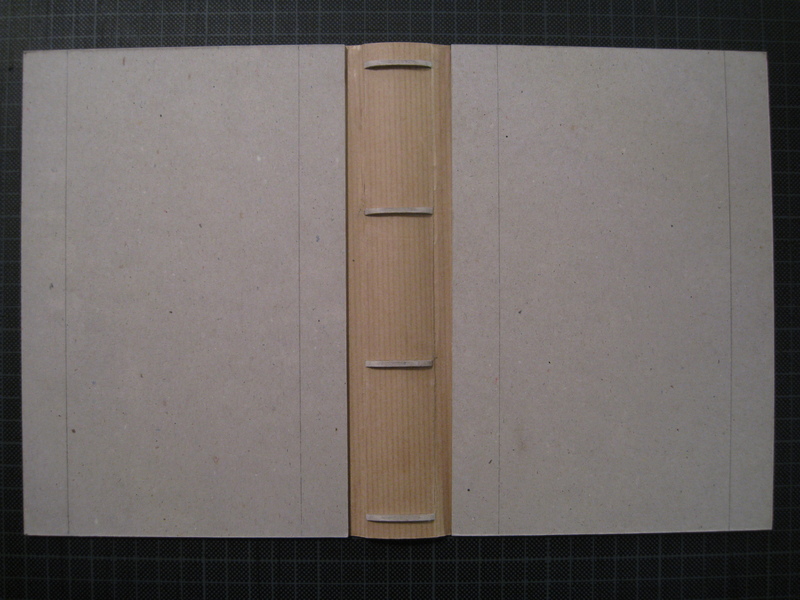 These result from the thick cords that were traditionally used when sewing the book block (instead of the flat sewing bands I used): the cords sit on the back of the spine, and the cover accordingly could not be completely flat. So these bumps cover the cord. False bands mimic this effect. They are purely decorative, and I think they give a book a beautiful classic look. To prepare the case for false bands, I’m gluing thin pieces of grey board (alternatively, pieces of leather could be used) onto the spine. And that’s it, the case is ready. Now that the basic case is ready, I need to decide on the design of the actual cover. 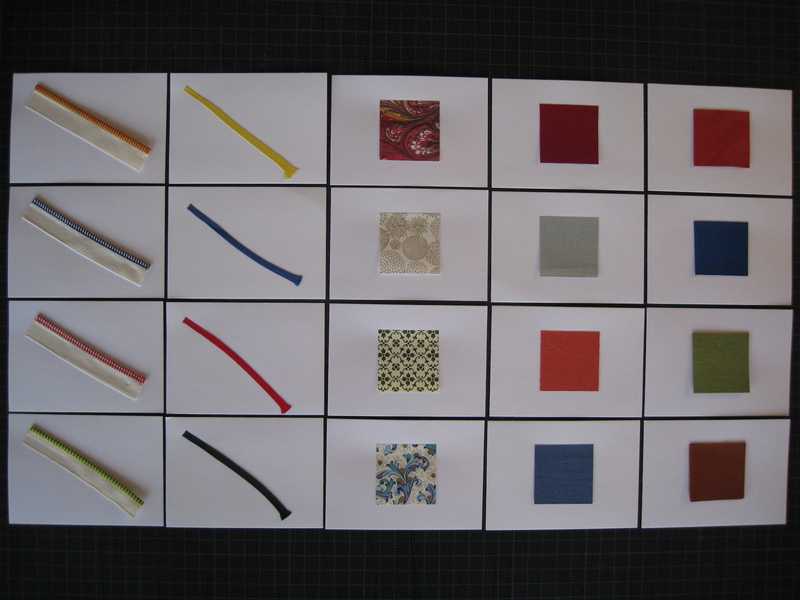 There are many ways how the cover of a book can be designed, and there are many materials you can use. 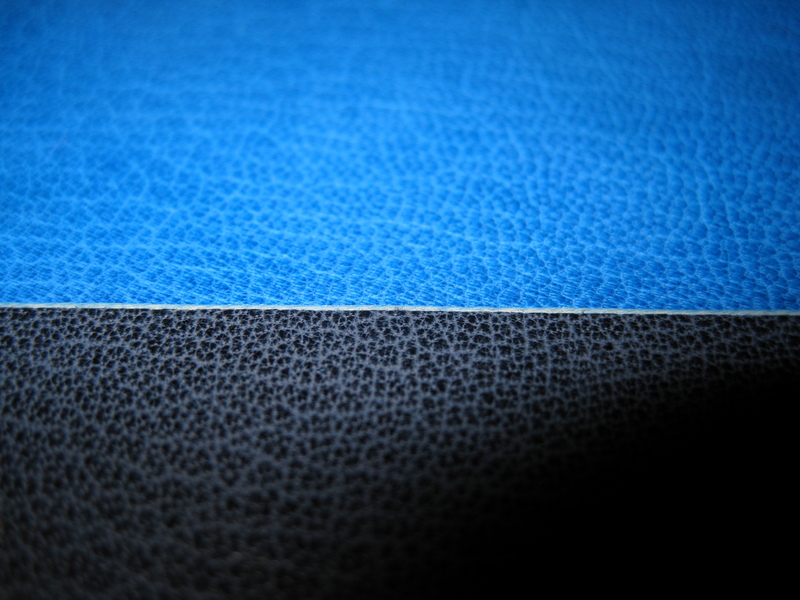 Genuine leather is probably the most ‘special’ and valuable material, but there is also a huge variety of beautiful coloured papers and bookbinder’s linen that make wonderful covers. And they can be combined, of course. Or if you want to go medieval you could also add ornamental metal fittings (or precious stones if you happen to have any lying around that you don’t need any more)—although this is something I have not yet done. 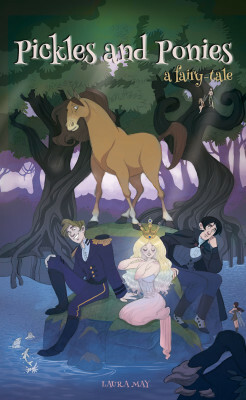 There really is no end to what you can do with the cover of a book, depending on your personal tastes and styles. 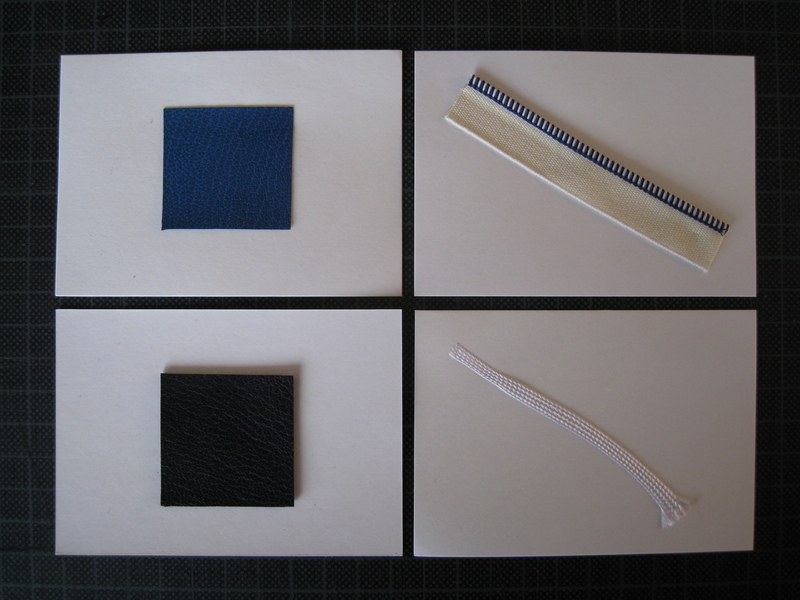 For In Memory, I want to have a classic full leather cover, albeit with a twist: I will assemble the cover from two different colours of leather. This might sound strange, but it will look great, I promise. When you get a skin like this, the first and vitally important step is to smell the leather. No, there is no real reason why this needs to be done—the leather just smells really, really good. Trust me. Once this is done, it’s necessary to think carefully about how to cut pieces from such a skin so that as much as possible of it can be used. In addition, a skin like this has areas of different quality. For example, you can see in the middle of the skin a line that is a bit darker than the rest—this is where the spine of the goat once was. While you don’t want this discoloured streak in the middle of your cover, it’s very good to use on the spine of the book: this area is usually tougher than the rest of the leather, and this will make the spine more durable. This of course isn’t the skin I’m using for this project, as it has the wrong colour. But it’s the only whole one I have at the moment to show you. 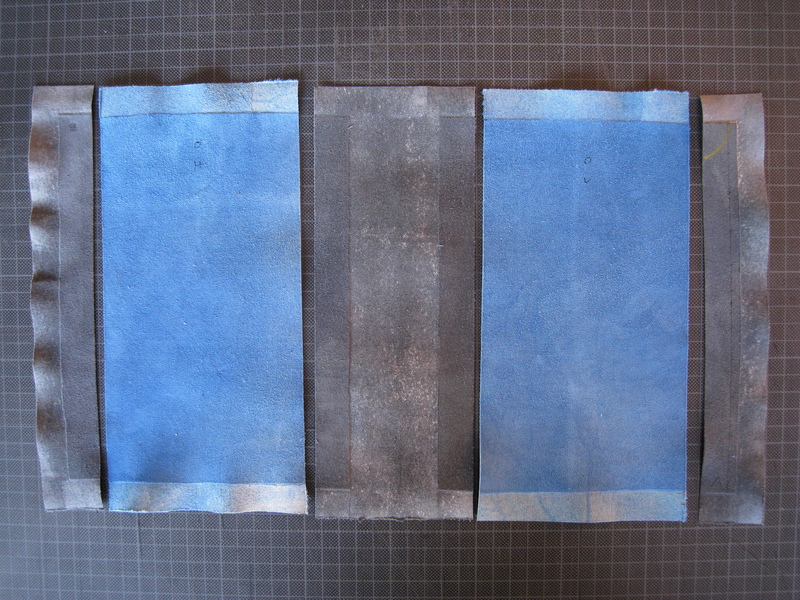 For the cover of In Memory, I’m using two skins of leather from which I’ve already cut pieces for other books. Although this skin has already been prepared by machine, it can’t be used as it is: it’s too thick. 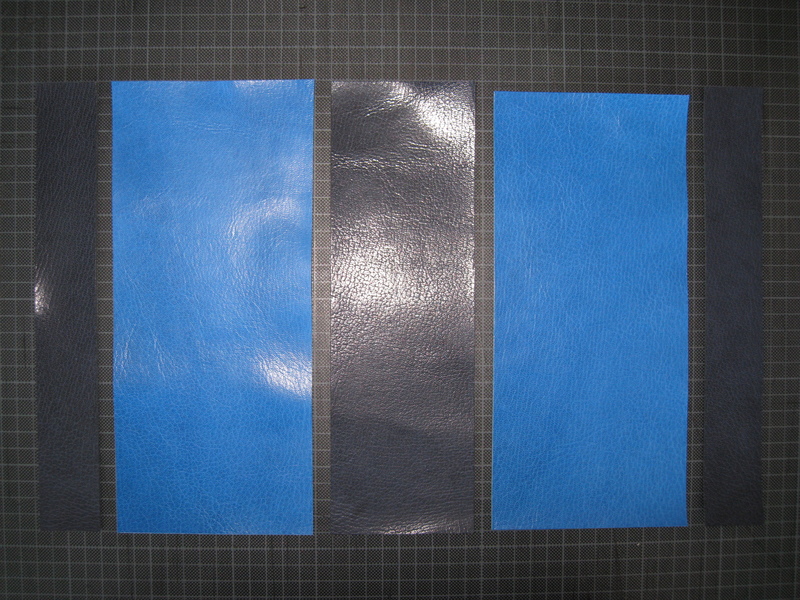 These pieces of leather have a thickness of 1.2 and 1.1 mm. 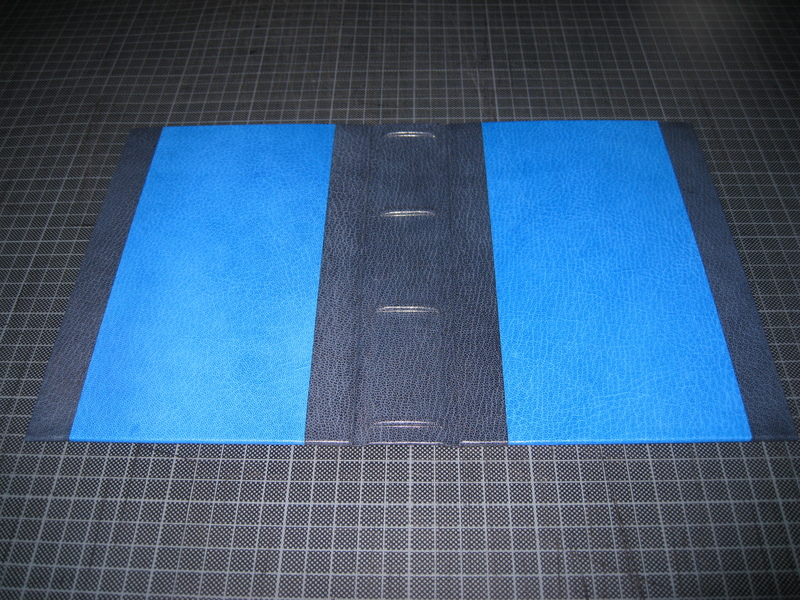 This is fine for the back and the front of the cover, but it won’t work for the hinges and wherever the leather needs to be folded—the leather may not be thicker than 0.5 – 0.6 mm for these purposes. So it’s necessary to ‘pare’ the leather. When paring a piece of leather, the flesh side is cut away. This is done in three stages. 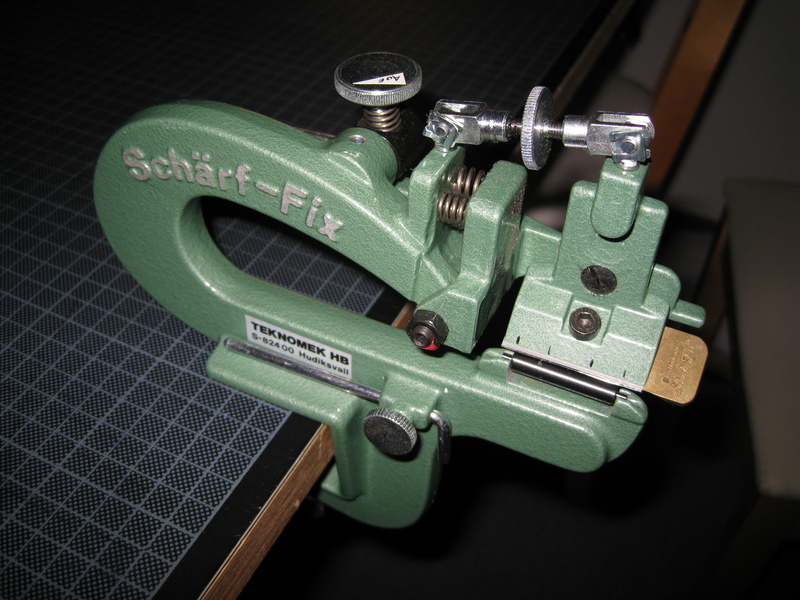 This tool has a roll over which the leather is pulled, an incredibly thin blade that is sharp as hell, and a precision mechanism with which to adjust the height of the blade. 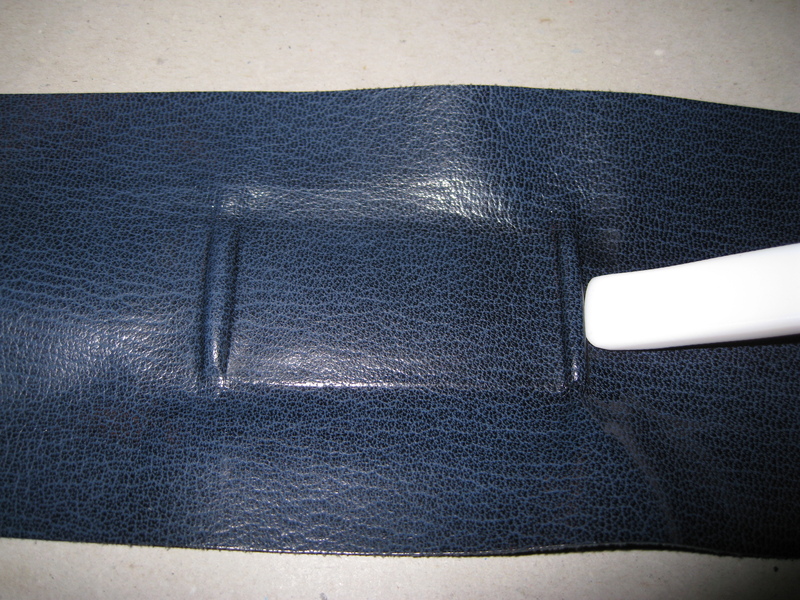 By pulling the leather with the grain side down over the roll, the blade shaves off part of the flesh side. This is done several times, and each time the blade is lowered. The blade has to be replaced constantly during this process as it requires a sharp edge to cut through the tough material. This requires patience and practise. And here is the fun part: make one mistake, and the leather is ruined. 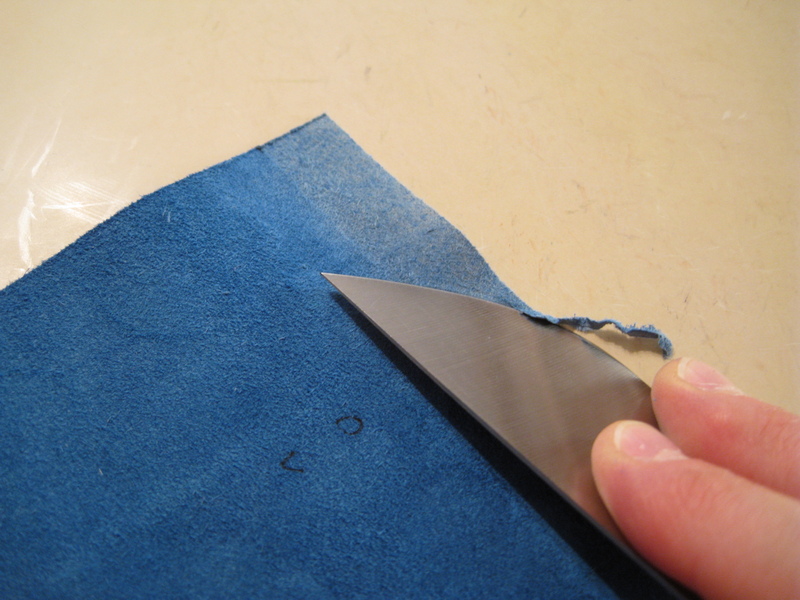 It’s hilariously easy to slip and cut through the leather, and there is no way to repair a cut other than covering it with something, and that’s usually not an option. You can distinctly see the areas where the leather has been pared and where it hasn’t. 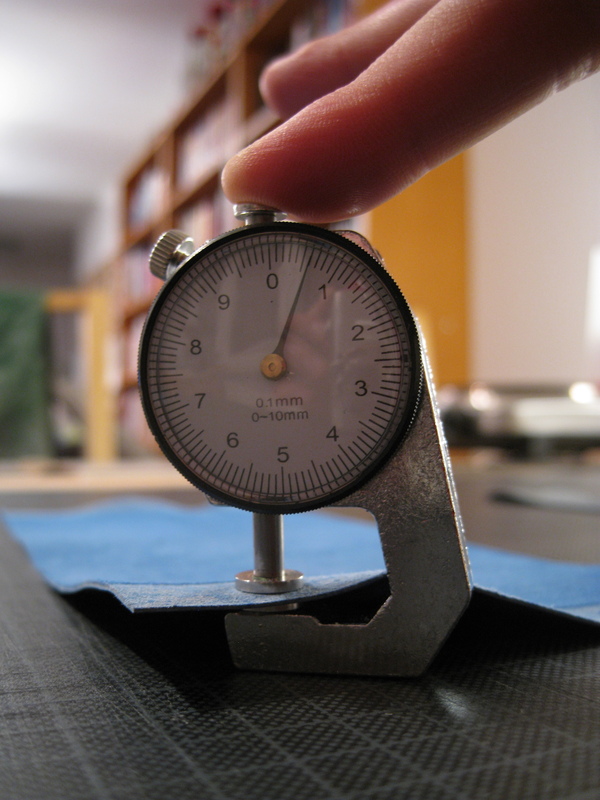 While paring the leather, it’s necessary to check its thickness in order to know when to stop. Leather that gets too thin can rip easily. These knifes originate from different countries. From left to right it’s Germany, France, and England, and they are known accordingly as German / French / English paring knifes. Personally, I like to use the French and the German paring knifes. The English one I have mainly because it looks like something that George R. R. Martin might use on Game of Thrones to kill one of his main characters. 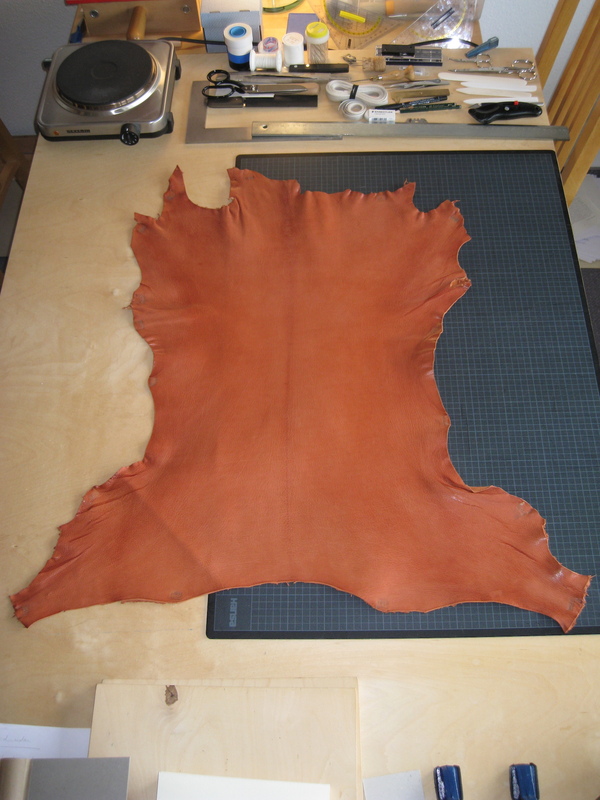 In the third stage, the edges of the pieces of leather need to be bevelled. This is done on a special paring stone, which is both smooth and hard and allows the knife to slide over it without damaging its edge. 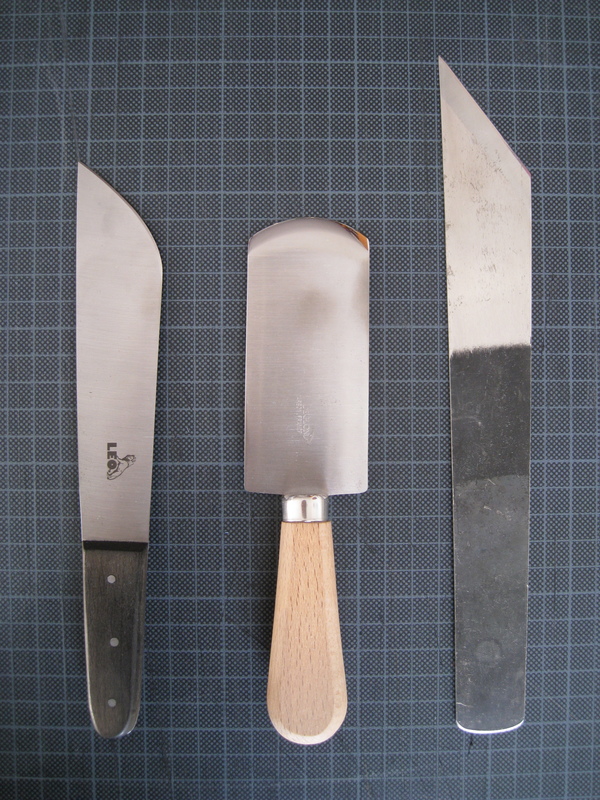 This time, I’m using the German paring knife. The difference is only a tenth of a millimetre, but that’s really a lot as you can see. It would look horrible on the cover. So I need to do some additional paring in order ensure that they have the exact same thickness. But then the leather really is ready. So now the moment has come to glue the five pieces of leather onto the case. When working with leather, you always need to make sure that your hands are clean, and this is especially vital when working with glue—it’s impossible to remove glue that has gotten onto the grain side of the leather by accident. And nothing beats that moment when you’ve finished a beautiful cover and then notice that there is a smudge of glue, and all your work is ruined… Happy times. The first piece of leather I’m gluing onto the case is the one covering the spine. This is a bit tricky because of the false bands: the leather needs to be carefully rubbed into the corners of the false bands using a bone folder without applying too much pressure so not to leave any marks on the leather. This particular bone folder is made from teflon, by the way. 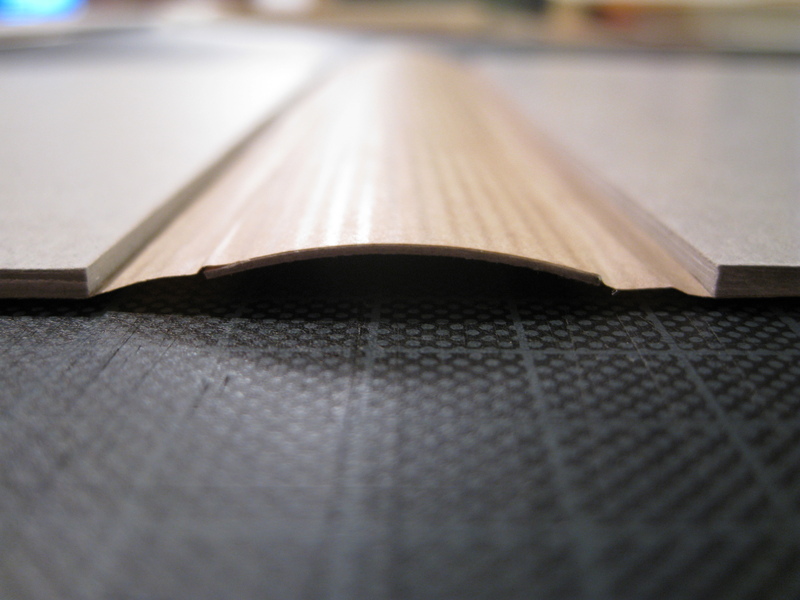 That’s right, we’re using materials developed for space travel. 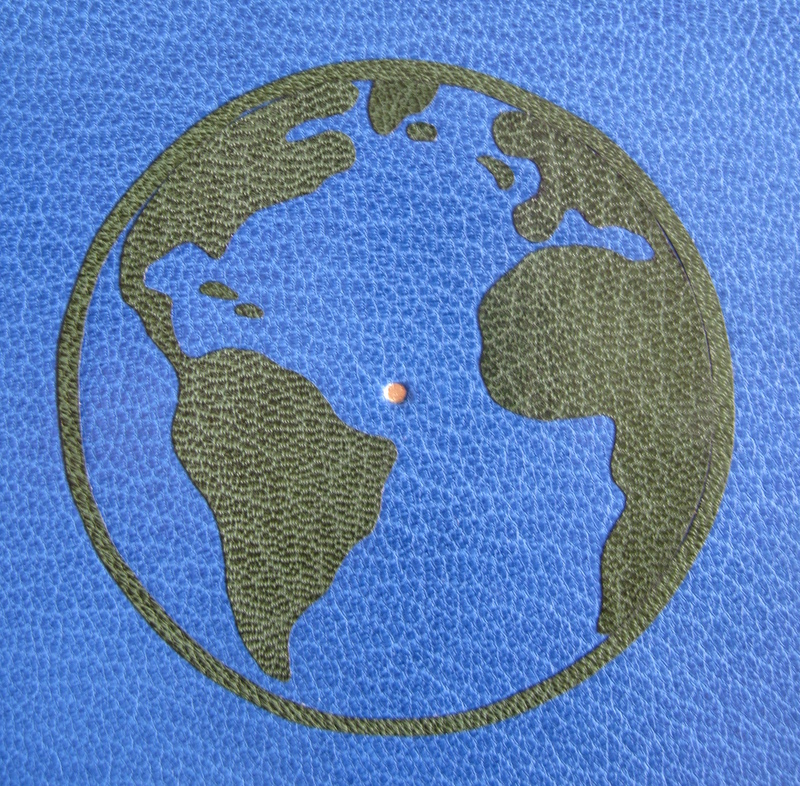 Bookbinders are basically astronauts. The glue I’m using is a mix of a special kind of dispersion glue and common wallpaper paste, and it works for gluing leather on grey board, paper on grey board, and paper on paper. 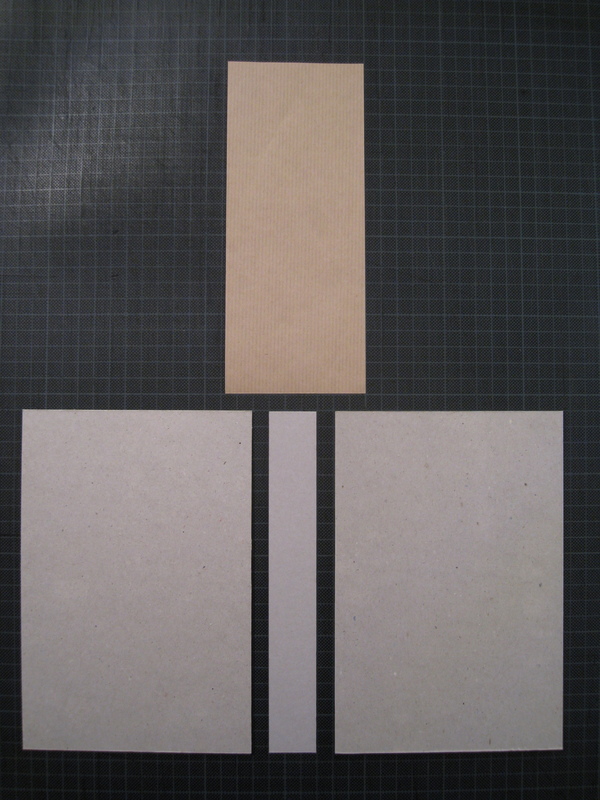 To glue grey board on grey board, or the back of the book block, you use pure dispersion glue. 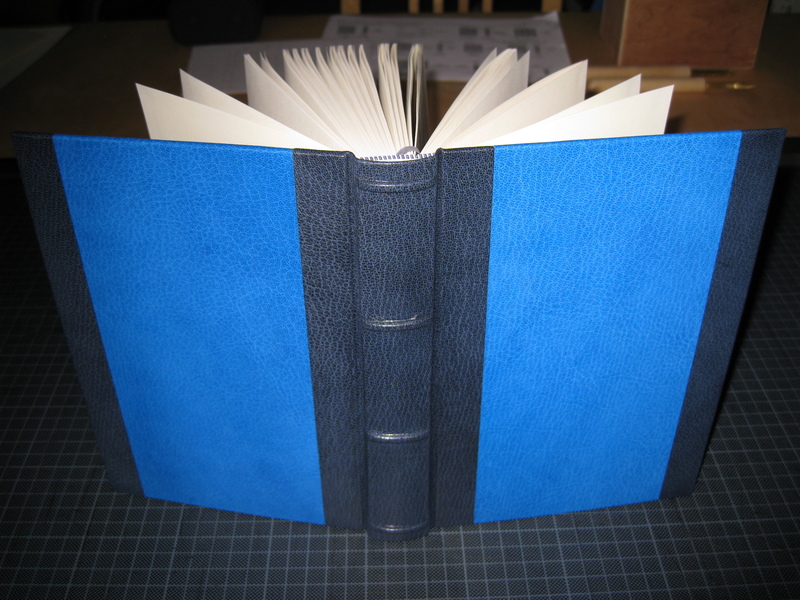 Once the leather is in place around the false bands, it is glued into the hinges and onto the front and back covers. The parts protruding over the top and bottom of the case are folded over and attached as well. 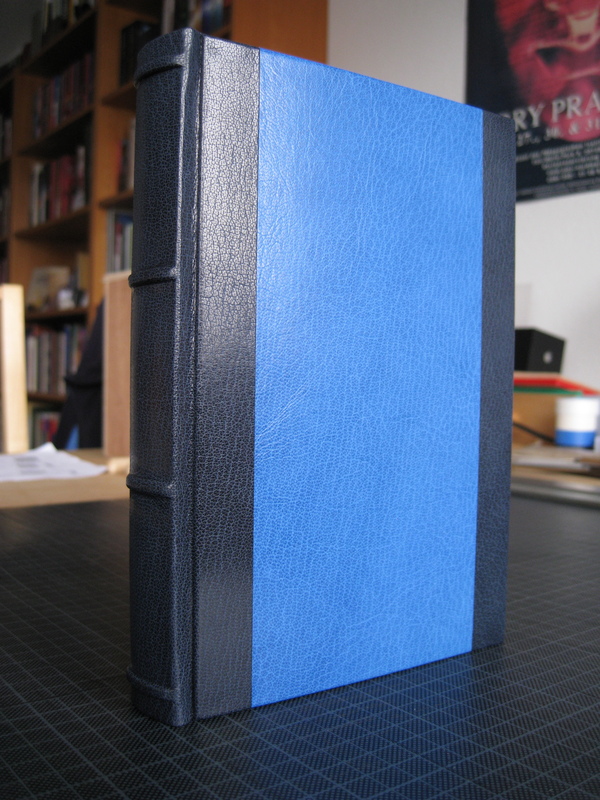 Now the other pieces of leather can be glued onto the case, working from the spine to the edges. 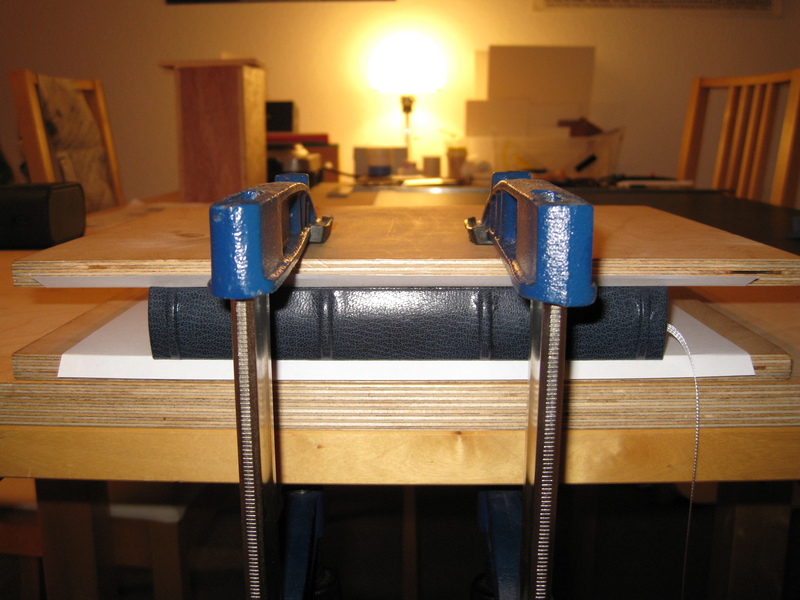 The final step is to glue the book block into the case. 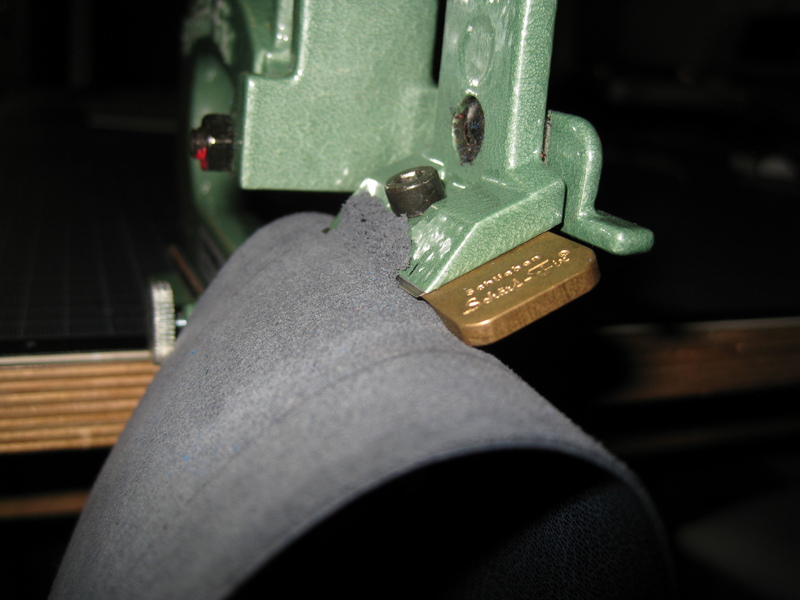 This process is known as ‘casing-in’ or ‘pasting down’. 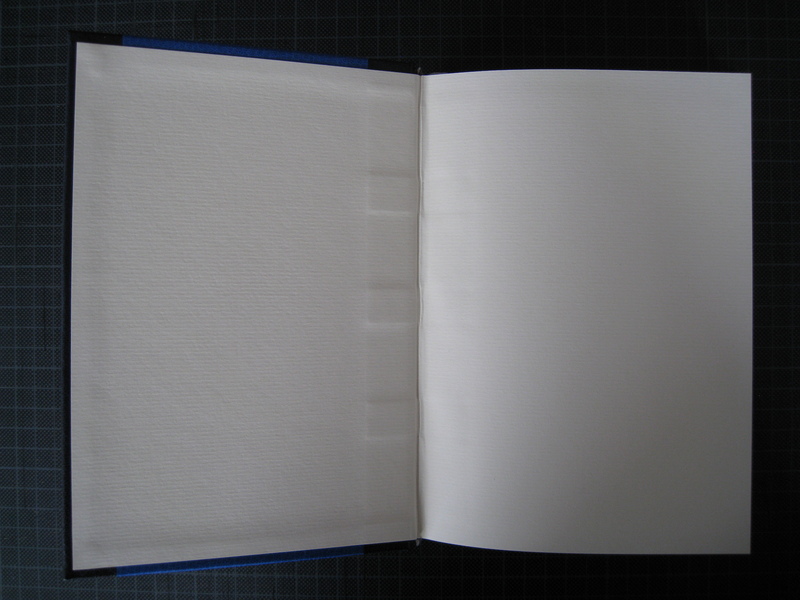 Basically, what needs to be done is to position the book block in the case, making sure that it’s equidistant to all edges. 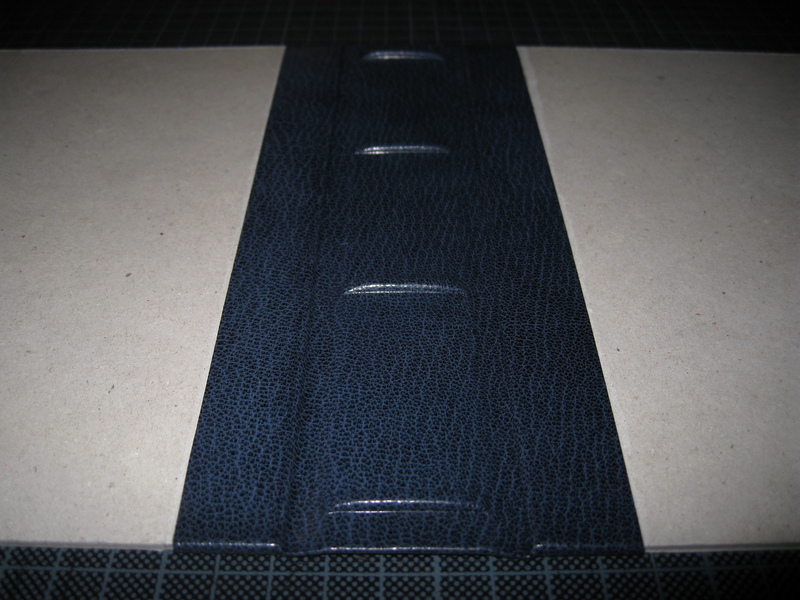 Then glue is applied to the end-paper of the book block and the cover is pressed down onto it. Sounds easy? Well, it’s really not. 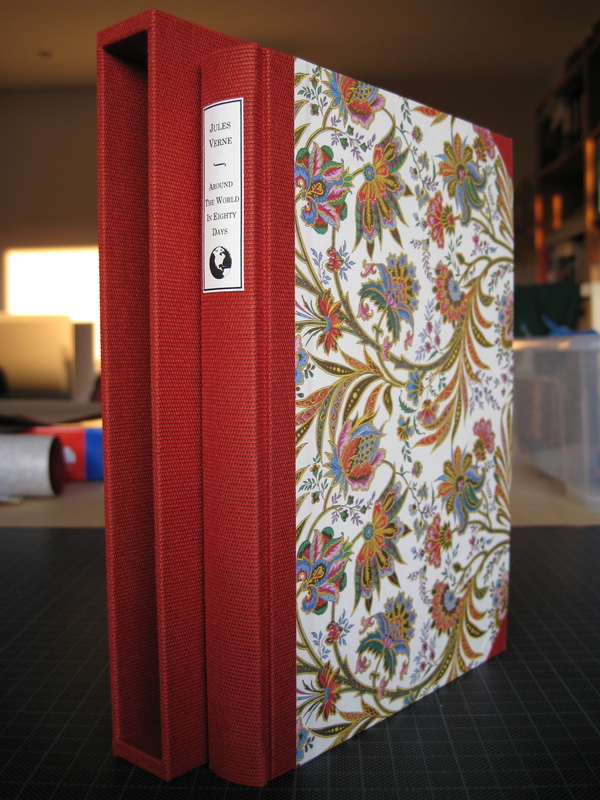 In fact, it’s a nerve-wracking thing to do, because you only get one chance to get it right, and there isn’t anything you can do in case you made a mistake—if the book block isn’t placed properly, or if you push it ever so slightly out of position while pressing the cover down onto it, then the book block of your book will be askew, and it will stay that way until the day robots take over the world and burn all the books because they are incompatible with their clumsy metal claws. This makes it a bit easier and safer, but the results can still vary. Luckily, it worked fine this time. 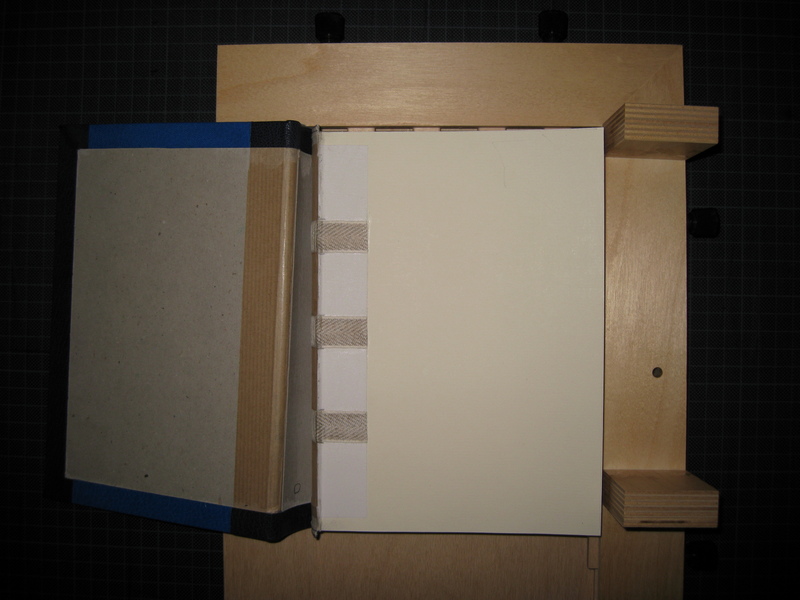 Once both sides of the book block have been glued into the cover, the book needs to be pressed. If the book is taken out of the press too soon, then the covers will bend due to the paper contracting when it dries. 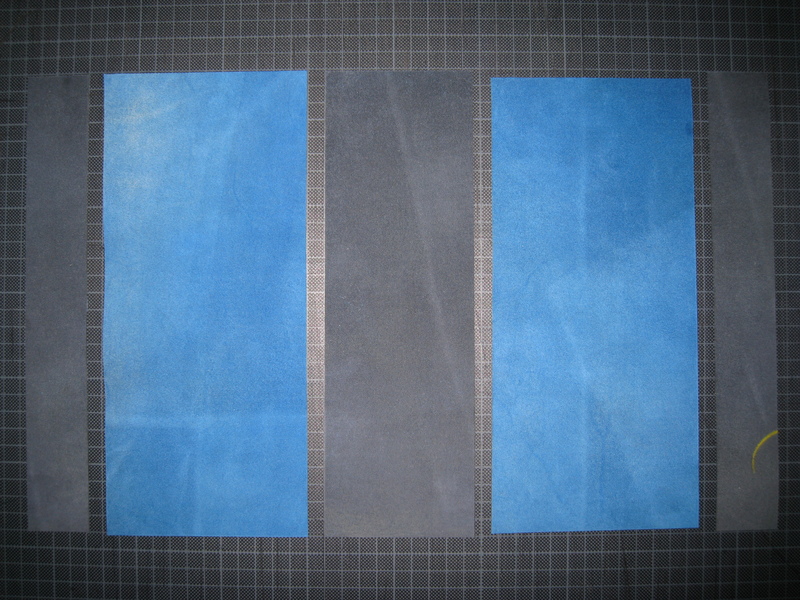 And if either the grey board or the paper used for the end-papers has the wrong grain direction, then gluing the book block into the cover will result in a mess: the finished book will be skewed because the materials are pulling in different directions when they dry. That’s why it is so important to always check the grain direction. The real question here is whether this is actually the most difficult thing in the world or not.